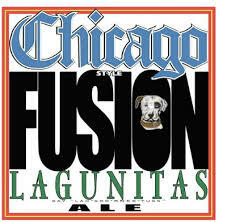 Lagunitas is one of the US’s leading craft breweries, renowned for its highly hopped ales and now it has expanded its operations to the east of the country with a new 300,000 square foot brewery, bar and restaurant in the old Ryerson Steel Complex of Chicago’s Douglas Park neighbourhood. When finished the new brewery will have 120 fermenters and produce around 1.5 million barrels of beer a year – making it one of the largest craft breweries in the US. The taproom itself is 4,000 square feet and has a capacity of around 300. A series of raised walkways allow visitors to the bar to stroll above and around the brewery which is adjacent. Lagunitas founder, Tony Magee (who was in fact born in Chicago), told the Chicago Tribune that the design of the taproom with its long trestle tables was designed to create a sense of “community”.